St. Paul, Minn, (USA) -- Jim Reynolds began his 40-minute talk to a group of Mayo Clinic physicians last week by closing his eyes, putting his palms together and singing an ancient plainsong chant in a dead language. “All human beings are of the nature to get sick, to get old and to die,” he sang to the group of doctors, first in the archaic Indian Pali language, and then in an English translation. Jim Reynolds, you will have guessed by now, is a Buddhist monk. He is actually now known only by his Buddhist name, Ajahn Chandako, and he serves as the abbot of a monastery near Auckland, New Zealand. His head is shaved, he never handles money, and he owns little more than his begging bowl, a pair of sandals, and the coffee-colored robes on his back. 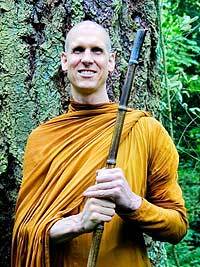 Ajahn Chandako (the name means “one who zealously seeks freedom”) is also a Minneapolis native and a Buddhist spiritual teacher with a growing international reputation. Last week, he returned to his home state to teach people how to meditate and to give a series of pithy, gently humorous talks in Minneapolis, Grand Rapids, Northfield and Rochester. A knowing chuckle rippled through the room. The doctors absorbed Chandako’s graveyard humor as pragmatic wisdom – a useful reminder, perhaps, of nature’s ultimate primacy over all the powers of medicine. So, for a few minutes, in a conference room in the middle of a busy Mayo Clinic day, Chandako taught the physicians how to close their eyes and summon internal spaciousness and ease by using only focused attention and wholesome intention – the channeled inner zeal to become dis-ease free. 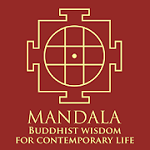 From a Buddhist view, Chandako told the Mayo group, illness is a profound opportunity for spiritual transformation. When skillfully and fearlessly embraced, Chandako said, illness offers a rare chance to directly experience the most essential truths of nature. While unwelcome and painful, such an experience naturally imparts an intrinsic wisdom that can replace deep-seated arrogance with humility, anxiety with equanimity, and narrow self-regard with broad compassion. The story of Ajahn Chandako’s emergence as a leading Buddhist teacher encompasses an epic journey from a bright Minnesota high-school kid with a passion for drums and girls, to a globe-trotting wanderer, to a disciplined meditator in bat-ridden Asian caves, to the worldly New Zealand abbot and global teacher that he is today. Born and raised in Minneapolis, and a 1984 graduate of Carleton College in comparative religion, Chandako says his boyhood was perfectly happy, roughhousing and building tree forts and watching TV. He doesn’t recall a particular leaning towards Buddhism, except for one thing. Throughout his high school college years, that strange inner call took a back seat to typical teenage distractions, especially rock and roll. He was a drummer in several bands – in “The Generic Band” the musicians wore plain white T-shirts that read “Drummer,” “Guitarist” and “Singer.” He readily admits to indulging in the pharmacological sidelines of rock-and-roll life. Social injustice and environmental problems stirred a strong desire to act in response, Chandako said, but he was dogged by a sense of unreadiness. His first taste of the monastic life came on long meditation retreats after college at the Hokyoji Zen Practice Community in Eitzen, in southeast Minnesota, under the famous meditation teacher, Katagiri Roshi. Those were followed by even longer stints as a lay meditator at a monastery in Thailand, where he was first exposed to Buddhist monastic life that was fully integrated into a society where monks had a firm and high standing. Nearly ready to don the monk’s robes, Chandako decided he needed to try one last fling with the world before bidding it goodbye. This remarkable interlude is described in one of the most beautifully-written travel memoirs ever penned by an almost-monk, The Outer Path – Finding My Way in Tibet. The story describes a harrowing foot-and-bicycle journey to Tibet in 1987, long before it was easy for Westerners to travel there. Chandako did so by forging travel documents and assuming a costume disguise. The book combines gorgeous descriptive prose with a young man’s struggle to meet the demands of an overwhelming inner drive to undertake ascetic discipline. Staring at the brightly flickering candle by which he writes, Chandako reflects on the pitfalls of his adventurous life, from his rock-and-roll days to his run-ins with Chinese police and nearly dying of hypothermia in Tibet. 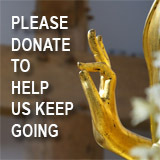 Within a few months, Chandako had returned to his Thailand monastery, shed all his excess baggage, shaved his head, and turned in his shirts and pants and shoes for a few plain squares of cloth and sandals. “I could have gone off to the Amazon and become an ecoterrorist, blowing up bulldozers that were ruining the rainforest,” Chandako said. “But I knew that would potentially harm other people, and it wouldn’t come from a peaceful mind. If one is practicing meditation correctly, it naturally leads to a reduction in anger and selfishness and greed. It very directly affects the people around us, our family and friends, the people we know best. Douglas McGill is a former staff reporter for the New York Times and London and Hong Kong bureau chief for Bloomberg News—and now writes for the Daily Planet.